One of my favorite sources, CQ Researcher, is celebrating it’s 90th anniversary! 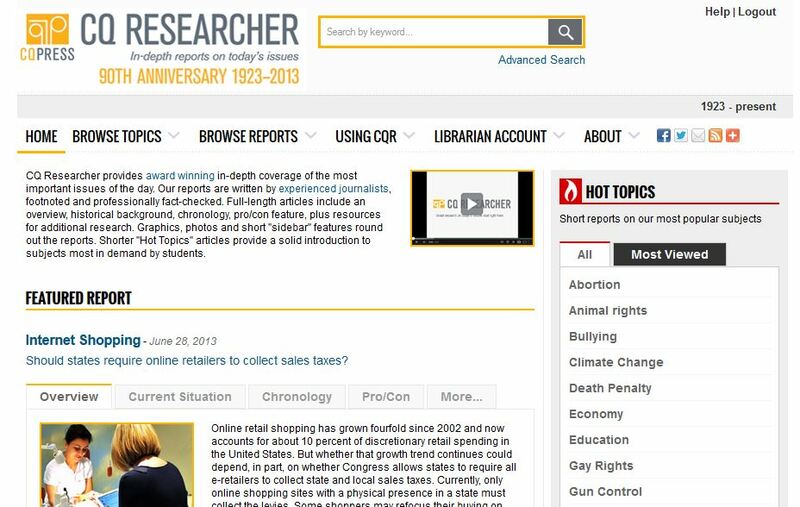 CQ Researcher is honoring this long standing resource with a new interface and a new feature – Hot Topics. The Hot Topics section should hit the target for many English Composition research papers. The feature that offers special, up-to-date reports and chronologies on 20 of the most-researched topics, including obesity, abortion, and marijuana legalization. The site also includes improvements in the browse and search functionality, a new logo, and a clean site design that makes all content easier to read and navigate. Published 44 times a year, CQ Researcher reports feature 12,000 words of footnoted text, bibliographies, a timeline of events, charts and graphs, photographs and more. Reports offer comprehensive analysis of topics ranging from climate change, gay marriage and immigration to conflict in the Middle East, the impact of social media on society, and gun control. So for your next Pro/Con paper check out CQ Researcher. You might also want to view our Hot Topic – Leading Issues which includes CQ Researcher with a video on how to use the new interface and a host of other great library resources including Opposing Viewpoints and SIRS – Leading Issues. Crime on the Rise What Works to Reduce It?